It is always the case that in Nigeria today, good leadership is still a mirage. Often times, individuals and groups come with open hands during election period to make promises to Nigerians and seek their votes. What these leaders have to offer is evidenced in the economic strangulations of the country today. However, all hope is never lost. Thanks to Nigerians who are strong people and can adapt to any socio-economic challenges in no short time. But how long do we keep adjusting our body and soul to bad leadership or bad economic policies that will only leave our economy in comatose? As the Bible aptly ask in the book of Romans; “must we continue in sin that grace might abound?” Must our leaders continue in their bad ways for us to keep suffering in silence? Must we continue to live with these sad situations instead of seeking lasting solutions? The South Eastern people of Nigeria are in need of a quality representative, someone who can give them a voice at the centre. As a matter of fact, someone who knows where the shoe pinches and would be willing to make the government to heed to the cries and aspirations of the people. 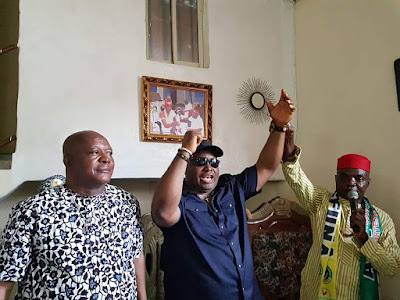 It is indeed a thing of joy when Dr. Patrick Ifeanyi Ubah, billionaire business man and CEO of Capital Oil and Gas, a man who has struggled to get to where he is today without being in government, decided to join the race for the national assembly because of his love for Ndị Igbo. Although, Ifeanyi Ubah has not held any political office in Nigeria before, he however, has a great wealth of experience in politics especially having served as an Aide to several African leaders. He has served as special adviser on political and economic matters to them. His astute and business minded way of solving governmental problems was put to use during the reign of Joseph Kabila of the Democratic Republic of Congo where he helped resolve a transportation crisis that would have put Kabila’s government to shame by rehabilitating 60% of government vehicles allocated for public use while other contractors that were given similar mandate failed woefully. This is just a case in point. This is the same man who has been a philanthropist extraordinaire, supplied petroleum products to every parts of the country and gave free kerosene to his people during periods of oil crises. This is the same man who has been involved in human capital development, a man whom through sports has enriched so many lives and has continued to do so till date. He sees the rich resources and advantages sports can bring to his people and to the country at large – thus his initiation of various football programmes like the One Family, One Footballer (1F1F) where he hopes to empower thousands of families through football. Many of such youthful endeavors that aim at empowering the youths are underway. This is indeed a laudable and commendable gesture from Dr. Patrick Ifeanyi Ubah. Do we need mention the ultra-modern private stadium he has built for his people in order to exploit the gains of sports for youth empowerment and human capital development? His FC Ifeanyi Ubah continues to record successes in the national league within two years of inception. The football club has been a source of employment for the teeming youths like his other numerous investments across the country. What he has done for his people and for Nigeria as a whole cannot be over emphasized. He has indeed sacrificed a lot for this country. He believes that it will seem out of place to allow so many things to continue to go wrong without engaging government at the national level. This is why he wants to engage in active politics to savage what is left from the collapsed economy of the Igbo nation. We couldn’t agree more with him because he feels the need to sponsor and promote bills that will protect the common Igbo man doing business on the street and give back to Igbos their lost businesses and political economies. Let’s drum our unwavering support for this rear gem who has made Ndị Igbo proud and wants to make them even more proud by taking their interests to the floor of national politics. It is never going to be business as usual in the senate when Dr. Patrick Ifeanyi Ubah is involved in the decision making process of the country because his economic bills will redirect the Igbo economy to greater height. He is a practical man with practical solutions to the country’s problems especially as it affects Ndị Igbo. Therefore, the delegates of the All Progressives Grand Alliance (APGA) for the party’s upcoming Anambra South Senatorial Primary should see it as a necessity to vote en masse for Dr. Patrick Ifeanyi Ubah. This is the time for the good people of Anambra South Senatorial District to take their future into their own hands by saying in one voice: “EBUBEABUJA2019."